While the world was distracted with the news coverage of the Christchurch tragedy, business went on as usual in Washington. During a press conference on March 15, 2019, United States Secretary of State Mike Pompeo addressed the nation and the world on two foreign policy issues; first, the Senate vote on ending American support for the Saudi-led coalition fighting in Yemen and second, the International Criminal Court (ICC), an issue that has possessed the Trump Administration for over two years. “Second item I wanted to talk today about is the International Criminal Court. In a speech last year in Brussels, I made clear that the Trump administration believes reforming international institutions, refocusing them back on their core missions, and holding them accountable when they fail to serve the people that they purport to help. We seek to partner with responsible nations to make sure that international bodies honor the principles of liberty, sovereignty, and the rule of law. Nation-states come together to form these institutions, and it’s only with their consent that these institutions exist. Basically, Mr. Pompeo is threatening to penalize the International Court and its judges who would dare to investigate any untoward actions by American citizens even though the United States and its global national reengineering agenda has seen it overthrow and replace governments in Afghanistan, Iraq and Libya with its preferred version of democracy through the use of its military might. I’m guessing that people living in these nations would hardly regard the United States rule of law and justice as the “envy of the world”. Washington has also threatened to use economic sanctions against the ICC if they do not “change course” although it is somewhat difficult to ascertain how economic sanctions would work against a global body to which the United States is not a party. “Israel operates a two-tiered system in the West Bank that provides preferential treatment to Israeli settlers while imposing harsh conditions on Palestinians. While settlements expanded in 2017, Israeli authorities destroyed 381 homes and other property, forcibly displacing 588 people as of November 6, in the West Bank, including East Jerusalem, as part of discriminatory practices that reject almost all building permit applications submitted by Palestinians. Israel continued to maintain its decade-long effective closure of Gaza, exacerbated by Egypt’s keeping its own border with Gaza largely sealed, and to impose restrictions that limit supply of electricity and water, restrict access to medical care and educational and economic opportunity, and perpetuate poverty. Approximately 70 percent of Gaza’s 1.9 million people rely on humanitarian assistance. 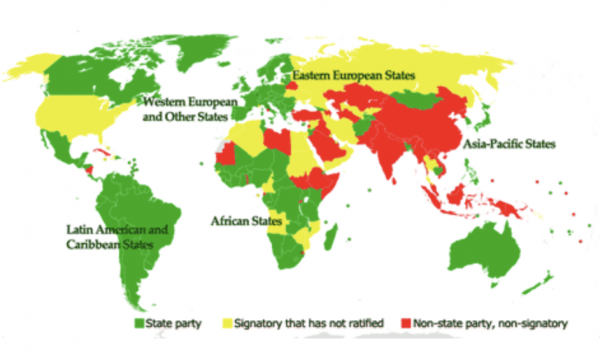 In total, 122 nations are State Parties to the Rome Statute with 18 being African, 18 being from the Asia-Pacific, 28 from Latin America and the Caribbean, 25 from Western Europe and other states. You will notice that there are several significant nations that are signatories but have not ratified the Rome Statute (meaning that the treaty is not legally binding); these include the United States and Russia. Several influential nations are not signatories including China, Saudi Arabia and, not surprisingly, Israel. In contrast, Palestine acceded to the Statute on January 2, 2015 and it was entered into force on April 1, 2015 and Venezuela, that nation that currently finds itself in Washington’s crosshairs, signed the Statute on October 14, 1998 and ratified it on June 7, 2000. It is interesting to note that the United States stands among nations that it vilifies for human rights abuses when it comes to its own standing with the Rome Statute of the International Criminal Court including Russia, China, Cuba and other nations throughout the Middle East and Africa. Apparently, international law does not apply to the world’s exceptional state. So much for freedom and democracy.